In West London, a devastating tower block fire has claimed the lives of 17 people. The fire appears to have spread via recently-installed cladding to the block, known as Grenfell Tower, which was originally built in 1974. That cladding was applied last year to the tune of $11 million; it was installed to insulate the 40-year-old structure and to appease the view from nearby conservation areas and luxury flats. The cladding project was part of the Grenfell Tower Regeneration Project carried out by design consultant Rydon for the Kensington and Chelsea Tenant Management Organization (KCTMO), who consulted the London firm, STUDIO E LLP, whose name appears on plans. The spandrel wall panel system used an ACM cassette rainscreen with an aluminum composite material covering polystyrene insulation. Polystyrene, according to the German flammability and combustibility rating system, is highly flammable or “Easily Ignited.” Subsequently, it is banned from being used in any exposed installations in building construction if the material is not flame-retardant. 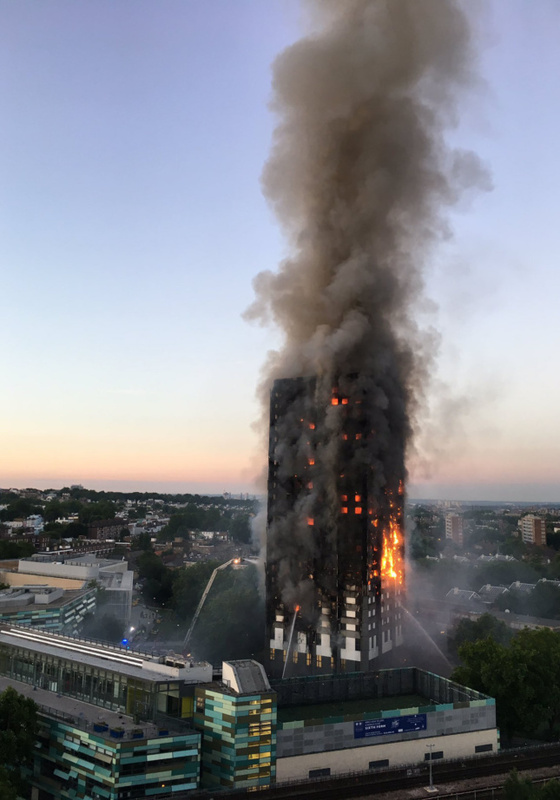 “The issue is that, under building regulations, only the surface of the cladding has to be fire-proofed to ‘class 0,’ which is about surface spread,” said Arnold Tarling, a chartered surveyor and a fire safety expert in The Guardian. “The stuff behind it doesn’t, and it’s this which has burned.” Speaking to The Architect’s Newspaper (AN), a London Fire Brigade Firefighter said that the structure’s cladding “made it act like a chimney.” The cavity behind the panels, he explained, allowed smoke to travel up the building and heat up the new facade before setting it on fire. “If the cladding hadn’t been there then the fire definitely wouldn’t have spread that quickly. 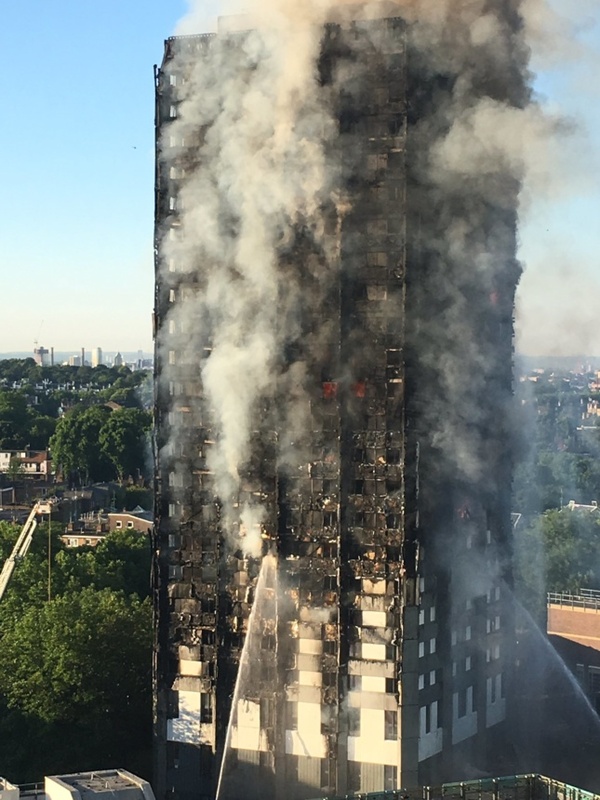 Usually, in tower fires, the concrete levels act as a sealed lock to contain the fire, but this has not happened here.” The Firefighter added that people who had their windows open during the hot weather could also have been a factor: this allowed the fire to reach more fuel such as furniture. Could this tragedy have been prevented? Many think so. There were repeatedly reported concerns to KCTMO, a private company in London’s wealthiest borough. These concerns, made by residents, raised issues of fire safety yet were ignored. In numerous blog posts that explicitly warned of a fire “catastrophe,” the council—instead of helping—replied by threatening legal action. Furthermore, 90 percent of residents signed a petition calling for an investigation into the organization that runs the building. However, the council turned it down. 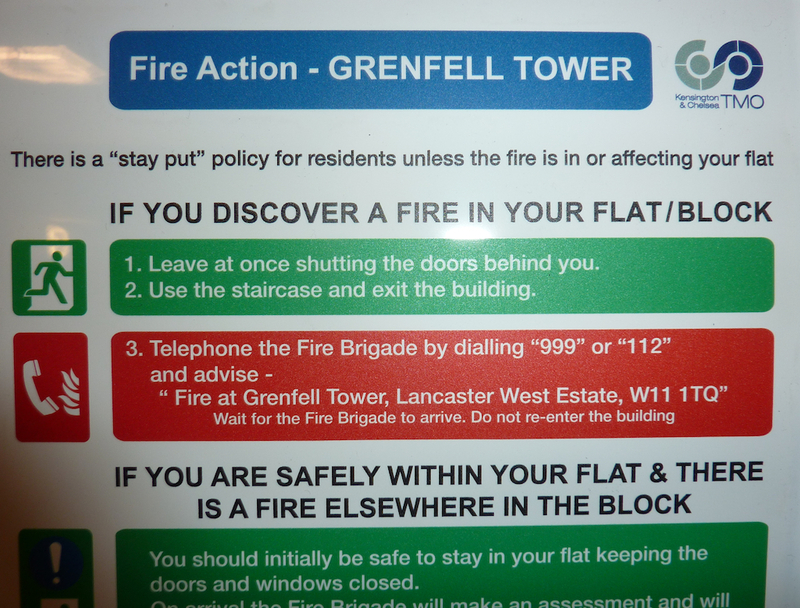 In addition to this, a fire action notice put up by KTCMO in the tower told residents to stay in their flat in the event of a fire. If that wasn’t enough, a fire at another London tower block (at Lakanal House, in 2009) which resulted in six fatalities appears to have been ignored. Findings in the resulting analysis discovered that inadequate fire risk assessments and panels on the exterior walls did not provide the required fire resistance. The local council was, however, fined $727,263 for its negligence. After such a tragedy, one would expect fire safety standards for buildings to be updated. It appears that was not the case. Though amendments were made in 2007, 2010 and 2013, none addressed the specific issues raised by Lakanal House. In 2016, seven years after the fire, Housing Minister Gavin Barwell said that the government will review part B of the UK’s Building Regulations, a section which covers fire safety. This year, Ronnie King, Honorary administrative secretary of the All-Party Parliamentary Group, said the building regulations “haven’t taken account of the Lakanal House fire inquest, or updated recent accredited research.” STUDIO E LLP’s work for KCTMO was approved in 2012, before Barwell’s announcement of a review into a fire which happened in 2009. 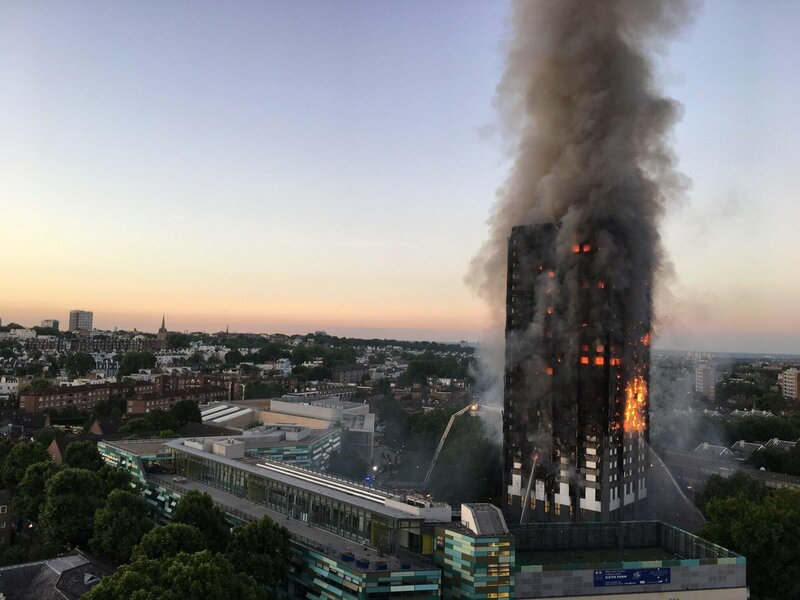 The incompetence and apathy regarding building fire safety are shocking, but this tragedy is the result of deregulation in the housing sector and removal of red tape that supposedly allows developers more freedom to build. Instead, it leads to worse and less safe housing conditions. And amazingly, the story of willful ignorance of experts continues. A survey from 2015 by the Fire Sector Federation, which discusses fire and rescue organizations, found that 92 percent of members thought that regulations were “long overdue an overhaul,” stipulating that they do not cater to modern day design and construction methods. In 2013, then London Mayor Boris Johnson of The Conservative Party told a Labour opponent to “get stuffed” when he was questioned about cuts to the fire service. More recently, in March this year, experts warned that the (Conservative) government’s delay in reviewing building regulations could be “endangering tower blocks throughout the UK.” Roughly 4,000 British tower blocks are in danger because of the outdated regulations. “We are still wrapping postwar high-rise buildings in highly flammable materials and leaving them without sprinkler systems installed, then being surprised when they burn down,” architect and fire expert Sam Webb told The Guardian. As a result of the fire, Grenfell Tower’s displaced residents are now without a home, and that’s a tough thing in Kensington and Chelsea where the average house price is $1,748,158. During the final stages of the housing bill in the Commons in early 2016, a Labour amendment to ensure landlords were required to keep homes in a liveable standard was voted down by 312 votes to 219, voted for by nearly the entire incumbent Conservative party. At that time, 39 percent of Tory MPs were landlords. To cater for the displaced and newly homeless residents, many are kindly offering their homes out for people to stay. Meanwhile, there are 1,399 empty homes in Kensington and Chelsea, more than anywhere else in the UK. The UK Prime Minister, Theresa May, has ordered a full public inquiry into the event.